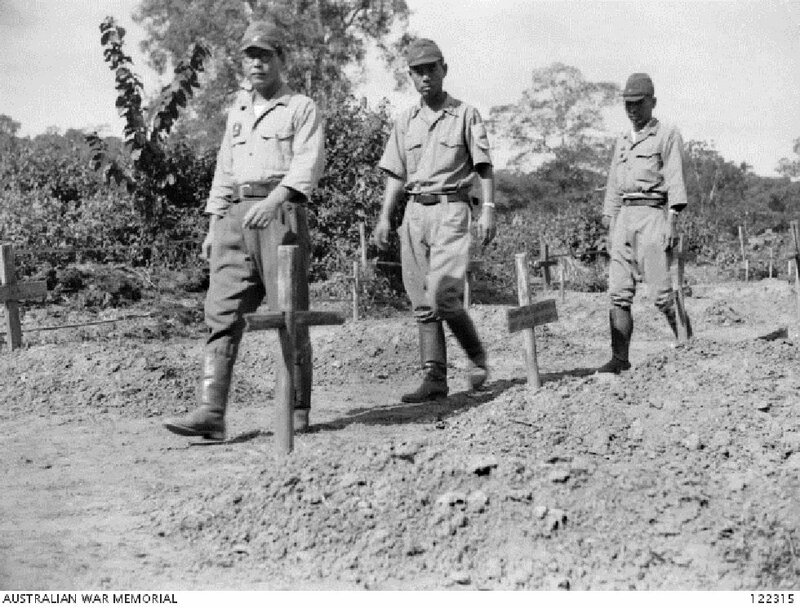 Three members of the Japanese maintenance party walking past Australian graves in one of the three cemeteries at Kinsayok. The Japanese army was ordered to provide personnel to assist the War Graves Commission survey party in locating, clearing and maintaining POW cemeteries and grave sites until the bodies could be exhumed for reburial in the war cemeteries at Chungkai, Kanchanaburi and Thanbyuzayat, 20 October 1945. Image courtesy of the Australian War Memorial. 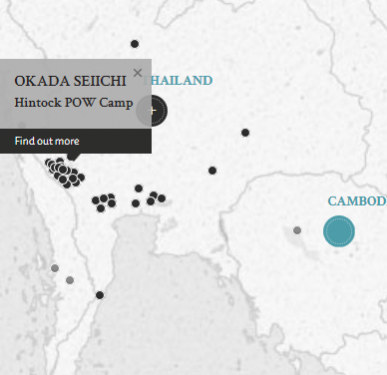 The defendant, a medical non-commissioned officer, was stationed successively at Kanu, Hintock, and Kinsayok POW Camps, Siam (present-day Thailand), and was charged with being concerned in the inhumane treatment of POWs contributing to the deaths of some of them and physical suffering to others. The policy laid down by the Japanese Commander of No.4 Group, POW Camp, Siam, was that, if the requirements of the railroad units made it necessary, sick POWs were to be dispatched on working parties. Two cases of abuse were specifically mentioned in the evidence, Private Purdy who was suffering from dysentery, and Private Wetherilt, who was suffering from diarrhoea. In both cases, the prosecution alleged that the defendant's inhumane conduct in ordering them out to work under the extreme unhealthy and rigorous conditions, contributed to their deaths. The period covered by the charge coincided with a time when the Japanese were supposedly ruthlessly employing labour to speed up and complete the construction of the Burma-Siam Railway. The defendant was known as "Doctor Death" as he was responsible for many of the POW deaths in the Konyu area while he was a medical corporal and sergeant there. Okada, Seiichi. Sergeant. From Japanese military. From Japan. Guilty. 10 years' imprisonment. Sentence confirmed. Butterfield, R.S. Major. From British Indian Army. Eber, John. Barrister at Law (Innter Temple). Saheki, Kiuji. Judge in Hiroshima Court. Lavin, J. Lieutenant. From British military.